Turkish Aydinid pirate ships roam the Aegean Sea, pouncing on Latin-held islands. And since Venice and Genoa are feuding with each other, it falls to the Hospitallers to engage in briny battle, where the Knights destroy or capture 22 out of 28 Aydinid vessels for an impressive victory. The Battle of Chios was a naval battle fought off the shore of the eastern Aegean island of Chios between a Latin Christian—mainly Hospitaller—fleet and a Turkish fleet from the Aydinid emirate. The Christian fleet was resoundingly victorious, but for the Ayinids, who had been engaging in piracy since the collapse of Byzantine power, it was only a temporary setback in their rise to prominence. (1319) Seafaring knights do battle in the Aegean. Decadent, politically ineffectual, and increasingly unpopular, Egypt’s King Farouk is overthrown by a military coup headed by future Egyptian president Abdel Nasser. The Revolution of 1952 will erase the last trace of British colonial influence from Egypt and the Sudan. Tensions between African American residents and the police flare in Detroit, Michigan, during an early morning raid on a nightclub. Before the riot ends five days later, 43 people will be killed, more than 300 injured, some 1,400 buildings burned, and more than 7,000 people will be arrested. Up against Russian and Romanian might, US women have put in a stellar performance at the Atlanta Olympics, and the first US women’s gymnastics team gold medal is secured when Kerri Strug sticks the landing on her second vault, despite having sprained her ankle on the first go. Decadent, politically ineffectual, and increasingly unpopular, Egypt's King Farouk is overthrown by a military coup headed by future Egyptian president Abdel Nasser. The Revolution of 1952 will erase the last trace of British colonial influence from Egypt and the Sudan. 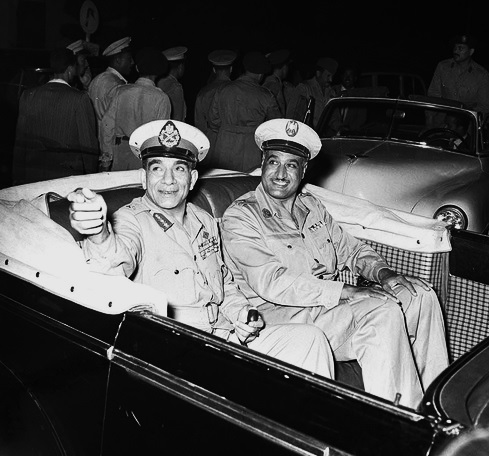 The Egyptian revolution of 1952, also known as the July 23 revolution, began on July 23, 1952, by the Free Officers Movement, a group of army officers led by Muhammad Naguib and Gamal Abdel Nasser. The revolution was initially aimed at overthrowing King Faruq. However, the movement had more political ambitions, and soon moved to abolish the constitutional monarchy and aristocracy of Egypt and Sudan, establish a republic, end the British occupation of the country, and secure the independence of Sudan. The revolutionary government adopted a staunchly nationalist, anti-imperialist agenda, which came to be expressed chiefly through Arab nationalism, and international non-alignment.